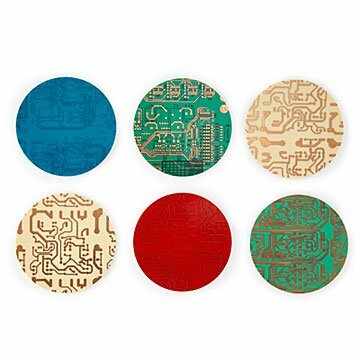 Retired circuit boards, turned into cork-bottomed coasters, make great gifts for techies and sci-fi fans. Cut into circles and turned into coasters with cushy cork bottoms, these retired electronic boards are emblems of the electronic nervous system of our world. In vivid colors, with metal circuits that gleam like polished jewelry, they make striking conversation pieces in the living room or out on the patio. For anyone with an emotional connection to electronic and digital technology—whether it's nostalgia for their early coding days, religious yearly viewing of The Matrix, or a never-ending love affair with all things Internet—they make quirky and cool gifts. They're packaged in a polished, stainless steel tin. Because they're cut from real circuit boards, each set is a little different from the next, and colors vary. Made in Lake Zurich, Illinois. We use these on the arm of our couch because we do not have side tables. I purchased this set for every day use on our wood furniture (desk, night stands(. They are very colorful and well made. The cork keeps the surface safe while the circuit board provides a decorative look (I'm a geek, so circuit boards fit my style). The sit evenly on the surface and come in a nice metal storage container. A great everyday gift idea for the techie in your life!